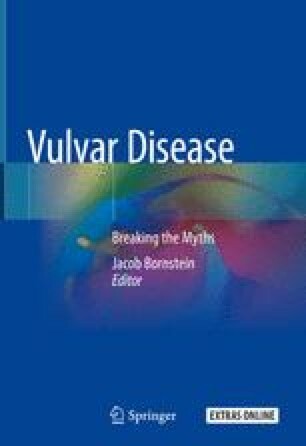 Eczematous changes may be superimposed on other dermatoses, complicating the evaluation of the vulvar dermatosis. Any chronic dermatosis can be affected, but the most likely are psoriasis, lichen sclerosus, and usual cutaneous lichen planus. Establishing the underlying diagnosis and the reason for supervening eczematous changes is the primary goal. Management should start by stopping all topical therapy and starting the patient on bland emollients. Then, mid-potency topical corticosteroid such as clobetasol butyrate 0.1% will aid in improving the eczematous changes. Targeting the underlying dermatosis can be commenced once the diagnosis is established.